How to use Think, Feel, Do! What do we mean by ‘Improve’? We mean creating reports and presentations that result in action. Yes, you want to use storytelling. Yes, you want to be visual. And yes, you want to create engagement. But, these three are a means to an end, and the end we are focusing on is whether your report or presentation makes it more likely that action will follow. 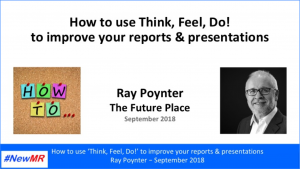 This webinar is a part of a series we will be producing with Ray that focuses on ‘How to …’. This webinar is also a trial of Zoom. Since 2010 we have been using GoToWebinar and we thought we should try something different. So, for those of you familiar with NewMR webinars, this one may be slightly different, and we may be a little bit less practiced at our end – please bear with us.